Yards Park, also known as the Yards, is one of the newest and fastest growing areas of Washington DC. It is part of a 42-acre mixed-use development that is located within the Capitol Riverfront, a 500-acre neighborhood that includes 2,800 residential units, 1.8 million square feet of office space, 400,000 square feet of retail space and a riverfront public park. The Yards is located five blocks from the U.S. Capitol and runs along the northern side of the Anacostia River. Some of the prominent landmarks in the area include Nationals Park (the baseball stadium for the Washington Nationals), the U.S. Navy Yard campus, and the headquarters for the U.S. Department of Transportation. The Anacostia Riverwalk Trail provides a wonderful space for strolling along the water’s edge and is becoming a popular place walking, jogging and biking. Yards Park is becoming a prime place to live, work and play with its waterfront appeal, access to sports and entertainment and proximity to Capitol Hill. Recent development has included the construction of luxury apartment buildings plus numerous restaurants, bars and retail stores. Green space has been designed with a modern flair to include open grassy areas, landscaped outdoor rooms, a waterfall and canal-like water feature, an elevated overlook, and a terraced performance venue. A marina will be built in the coming years. For suggestions of what to see and do, see 10 Things to Do on the Capitol Riverfront in Washington DC. 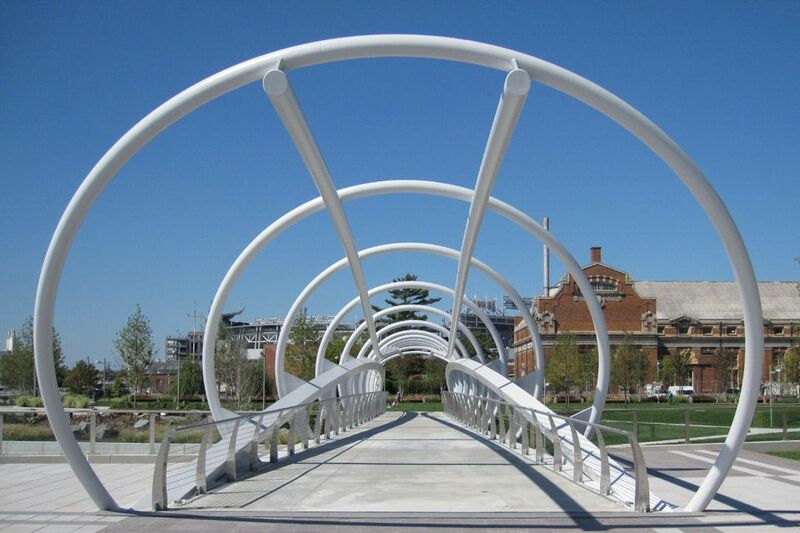 By Car: For driving navigation, Yards Park is located at 355 Water Street SE, Washington, DC. It is located just off of I-695 near the 6th St. SE Exit. Parking: There are pay-to-park surface parking lots off 3rd St, SE and off 4th St, SE directly north of the Yards Park. There is also public, metered street parking along Tingey St, SE and New Jersey Ave, SE, as well as sections of 4th St, SE, north of M St.
By Metro: The closest Metro station is Navy Yard, located at New Jersey and M Streets, SE. DC Circulator Bus - There’s a stop at 4th St, SE and M St, SE as well as M St, SE and at New Jersey Ave, SE and M St. The stop is on the Union Station-Navy Yard line. By Bike: Capital Bikeshare - You can take a bike from one of over 180 stations in DC and Arlington, and return it to a nearby docking station. There’s a docking station at the corner of M St and New Jersey Ave, SE – 2 blocks away from Yards Park. There is also a station at First St SE and N St SE next to the ballpark. By Boat: Water taxi service and chartered boat cruises are available from Diamond Teague Park located to the west of The Yards Park. The Potomac Riverboat Company offers water taxi service for baseball games. The water features are open from April through October, 8 a.m.-8 p.m. Kids can enjoy playing in the fountains and canal basin. The canal is 11 inches deep. No cloth diapers - only swim diapers are allowed. No dogs are allowed. There is no lifeguard on duty, so parents or an adult should supervise young children. The Washington Navy Yard was founded in 1799 and is located just to the east of the Yards Park/Capitol Riverfront area. The Navy Yard Annex was added in 1916, in reaction to World War I. By the mid-1940’s the Navy Yard and Navy Yard Annex accommodated 26,000 employees in 132 buildings on 127 acres of land. After WWII the Navy Yard became an administrative facility. By the early 1960s, the unused spaces were transferred to the General Services Administration. In 2003, the GSA conducted a nationwide request for proposals among private sector real estate developers to redevelop the former Navy Yard Annex site, including several historically protected former industrial buildings. After selecting a private developer to contract with the US Department of Transportation to construct their new headquarters building, the GSA then awarded the remaining 42-acre riverfront property site to Forest City Washington to redevelop as a new urban mixed-use, riverfront neighborhood.